The Daily Mail used its front page and 13 inside pages to make the case for leaving the EU today. There was no surprise at the Daily Mail’s editorial position. Press Gazette analysis shows that 18 of the paper’s last 27 front pages have favoured the Leave campaign. It has published no front-page stories favouring Remain. The Daily Mail sells an average of 1.5m copies per day. According to the National Readership Survey its print edition reaches 10m readers over the course of a month. The latest opinion polls suggest the UK is evenly split on Leave versus Remain. 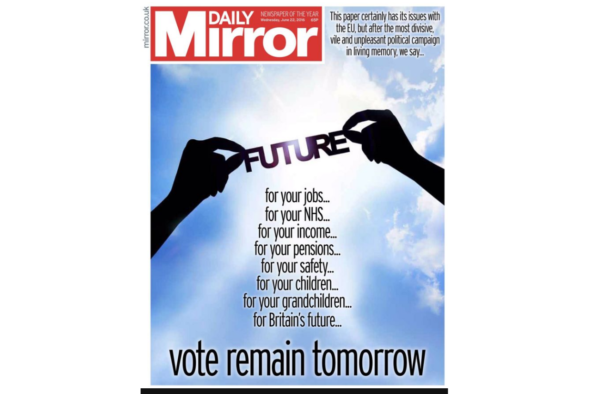 The Daily Mirror today urged its readers to vote to stay in the EU with a front-page story that urged its readers to vote Remain. Overall, the weight of UK national press coverage has been biased in favour of the Leave campaign with The Sun, Daily Mail, Express and Telegraph all favouring Brexit. 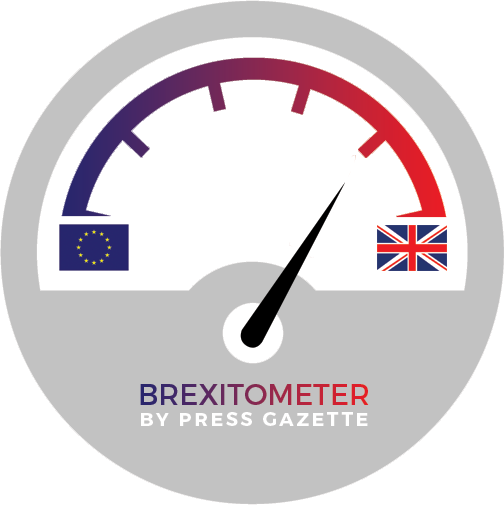 Press Gazette’s Brexitometer tracker chart (at the top of this page) tots up the total circulation of newspapers each day with front-page stories favouring Remain, versus those with front-page stories favouring Leave. For the last three days, the Sun, Mail, Telegraph and Express titles have all published pro-Leave front pages, they have a combined circulation of 4.2m. Today, the Daily Mirror, Times and Guardian all had stories backing remain on their front pages, a combined circulation of 1.4m. Titles with front-page stories favouring neither side had a total circulation today of 2.1m. The following chart totals up national newspaper front-page stories favouring either Leave, Remain or neither since 23 May. 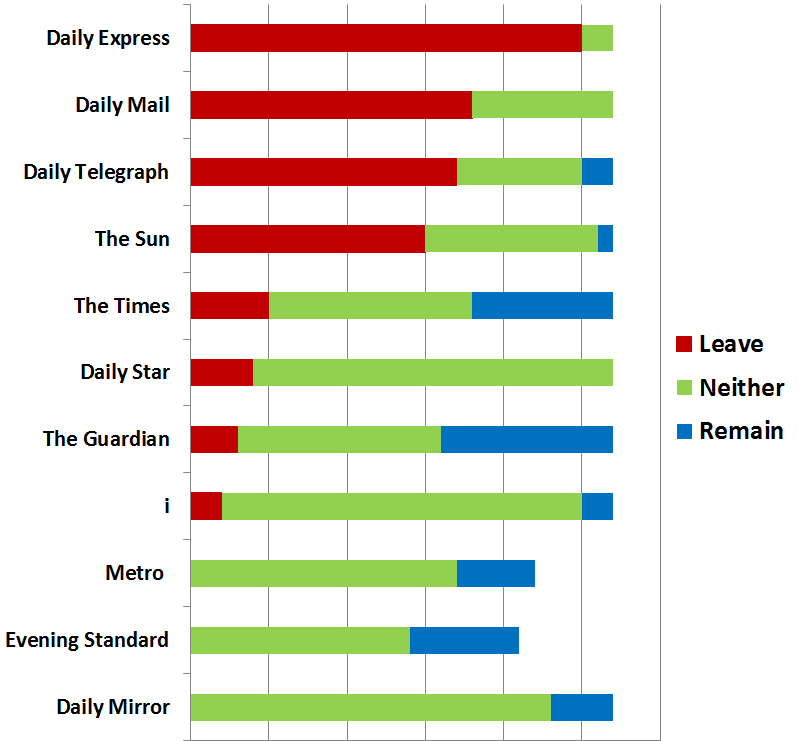 The Daily Express, Sun, Daily Telegraph and Daily Mail have all strongly favoured Leave in their front-page editorial coverage over the last month of the campaign. Other titles have been more even in their coverage, with The Guardian and Times swinging squarely behind Remain in their front page coverage over the last week. I Have lot’s of idea how to easily manage and work with Data Entry service for eCommerce Outsourcing. This is Only possible with the help of this valuable Online Tutorial. Thanks!